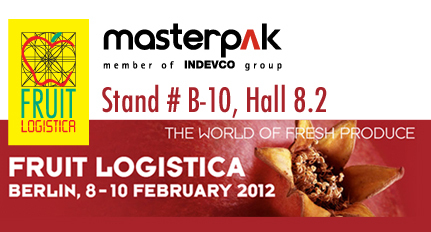 By attending FRUIT LOGISTICA 2012, Masterpak aims to stay up-to-date with the latest technologies, market and industry trends, and check for new and innovative products in the sector. FRUIT LOGISTICA 2012 attendees can view agricultural, horticultural and industrial polyethylene (PE) films at Masterpak Booth B-10, Hall 8.2. The world's leading trade fair for the fresh fruit and vegetable business will take place from 8 - 10 February 2012 at Messe Berlin in Berlin, Germany. At FRUIT LOGISTICA 2012, Masterpak, in Zouk Mosbeh, Lebanon, will reinforce existing agricultural customer relationships, as well as meet with new prospects from Europe and other countries interested in agricultural and horticultural PE films. The PE film manufacturer will also promote industrial films, such as machine stretch film, manual stretch film, shrink hood film, and shrink wrap film at the annual fresh produce trade fair. Global players, as well as small and medium-sized suppliers throughout the fresh produce value chain will be present at FRUIT LOGISTICA 2012. At the 3-day fresh produce exhibition, attendees from all around the world benefit from opportunities to initiate business deals, make worldwide business contacts, and gain a complete industry overview.